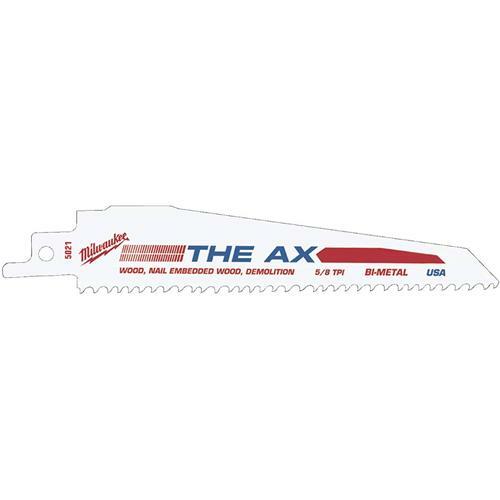 12" Sawzall AX Reciprocating Saw Blade, 5 TPI, 5 pk. Milwaukee 48-00-5027 - 12" Sawzall AX Reciprocating Saw Blade, 5 TPI, 5 pk. 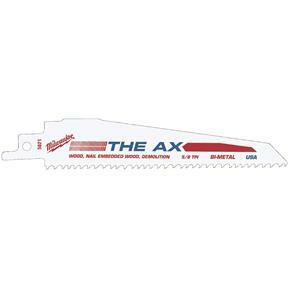 The Milwaukee 48-00-5027 The AX 12-Inch Super Sawzall Blade are designed for the toughest cutting applications in wood and nail-embedded wood. 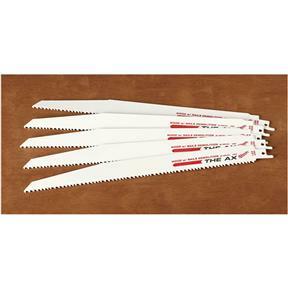 These blades have a sloped shape for superior plunge cutting for demolition and remodeling work. The blades are 1 inch tall for straight, fast cutting, and an extra-thick, 0.062 inches, to prevent bending. A unique heat treating process extends the life of the blades, and bi-metal construction prevents them from shattering. These extra-long, 12-inch long blades are ideal for cutting into walls that contain wood, nails, plaster and aluminum, and they feature a 1/2-inch universal tang that fit all Sawzalls. This pack include 5 blades and comes with a 5-year limited warranty.